With the arrival of the new BMW Z4 looming on the horizon, this previous-gen Z4 packs a little something extra to grab your attention. : the 5.0-liter V10 from the BMW M5. 2009 BMW Z4: Hairdressers Rejoice! 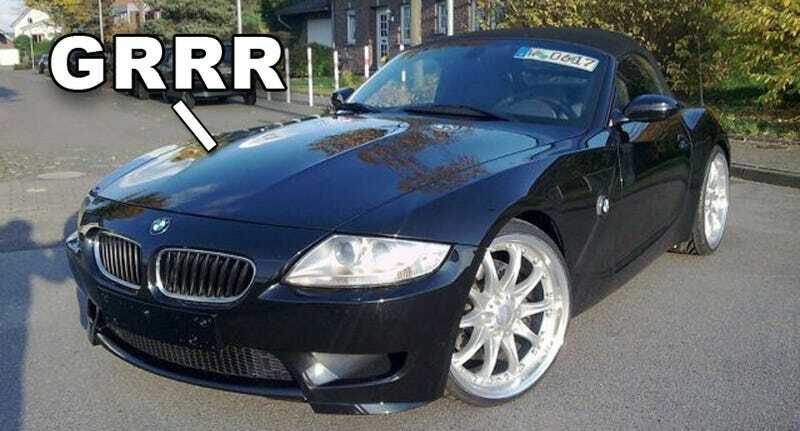 A lot of you were enraged when we referred to the 2009 BMW Z4 as a hairdresser’s car. Today we bring you the non-hairdresser version of the Z4 and it’s not the M Roadster. OK, we lie, it was an M Roadster at one point, but the owner wasn’t content with the paltry 343 HP inline six it was packaged with from the factory. No, they needed more -– much more. The six was ripped out and replaced by what some call a technical marvel or possibly just the 2005 Engine of the Year — the 5.0-liter V10 from the BMW M5 / M6. It appears the M5’s donor V10 fits perfectly under the hood of the Z4 and it likely packs quite the wallop when the go pedal is stomped. But when you decide to go, it’s not the stock 507-hp that you’ll be feeling, but a Hartge-tuned 551-hp instead. All this power is routed through a six-speed manual gearbox allowing this non-hairdresser’s Z4 to rocket to 60 much faster than the stock M5’s 4.7 seconds. The Z4 appears mostly stock from the exterior with the exception of a set 20-inch Hartge wheels – a true sleeper indeed. The asking price for this little beast is a non-carpocalypse friendly 97,900 Euros which rounds out to roughly $140,000 U.S. For that money, you could almost buy five standard M Roadsters to strut your pretty self in, but we’d rather have just this one so we could lay to rest the hairdresser debate once and for all.